A house is more than just cute wall decor or comfortable furnishings. A house is a home when it helps you remember the past, embrace the present and also encourages you toward the future. As I wrote in my post 5 Ways To Turn Your House Into A Haven, decorating with Scripture reminds us daily of the hope we have in the Lord. 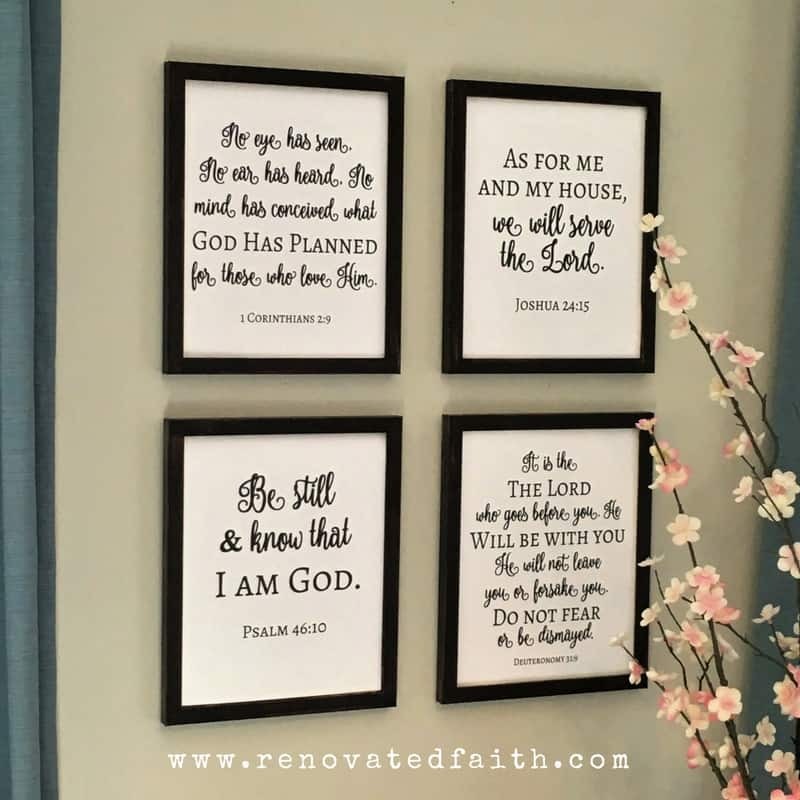 Here I share simple ways to decorate with Scripture by adding touches of God’s Word to your home while staying consistent with your style. 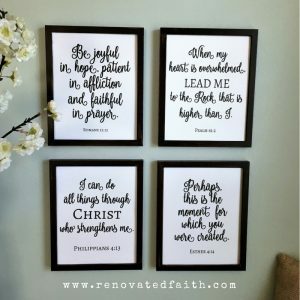 Why Decorate with Bible Verses? Some affiliate links are used in this post. You can see my disclosure here. According to this verse, God’s Word will never return void. When God sends out His Word, whether it’s read, spoken or shared on social media, it will ALWAYS accomplish something. In other words, God’s Word will always accomplish the purpose for which He sends it. Now, imagine the application in your home. You are having a rough day and you walk by some wall art of Psalm 61:2 that says, “from the end of the earth I call to you when my heart is faint. Lead me to the rock that is higher than I“? What a great reminder that we can call out to God in prayer whenever we are in need and He will answer us. Surround yourself with God’s Word so you can remember the truth that God breaths into your life every single day. 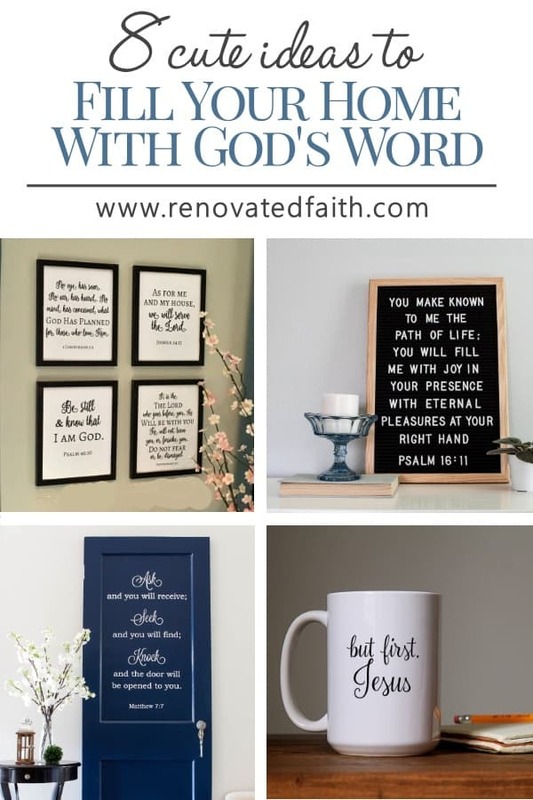 There’s no better way to remind yourself of the peace that only God gives than by decorating your home with Scripture. 2 Timonty 3:16 says, “All Scripture is God-breathed and useful for teaching, rebuking, directing and training in discipline.” So from that verse we know that ALL Scripture is powerful and useful. I like to post verses that encourage me in however I’m struggling at the time. For example, in my wall art collage, I have the following four verses because they relate to relevant trials I’m going through right now. The nice thing is that these printables are easily interchangeable. 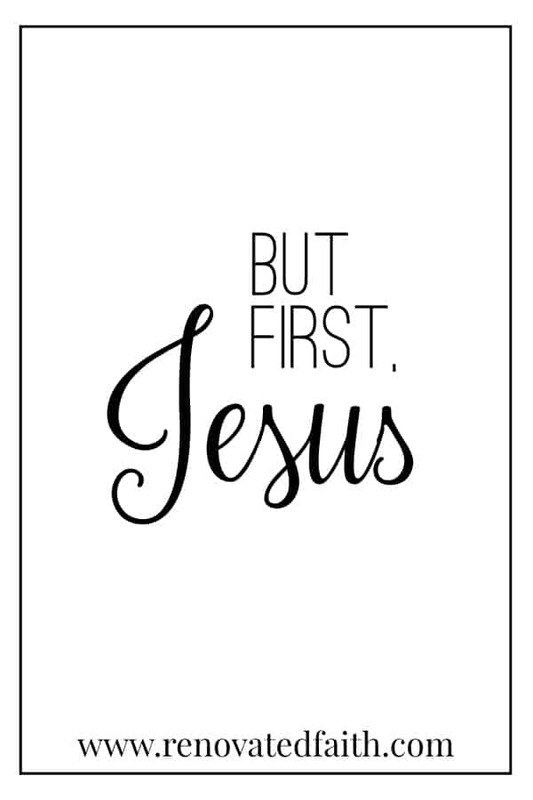 I have all of my free printables printed ahead of time and I simply swap them out as needed. Easy peasy! I also show you some tips to make them look even more like diy painted signs here. My free printables are interchangeable and there are dozens of verses for you to choose from so you can can make your own wall art gallery to encourage you throughout the day. You can download them HERE. 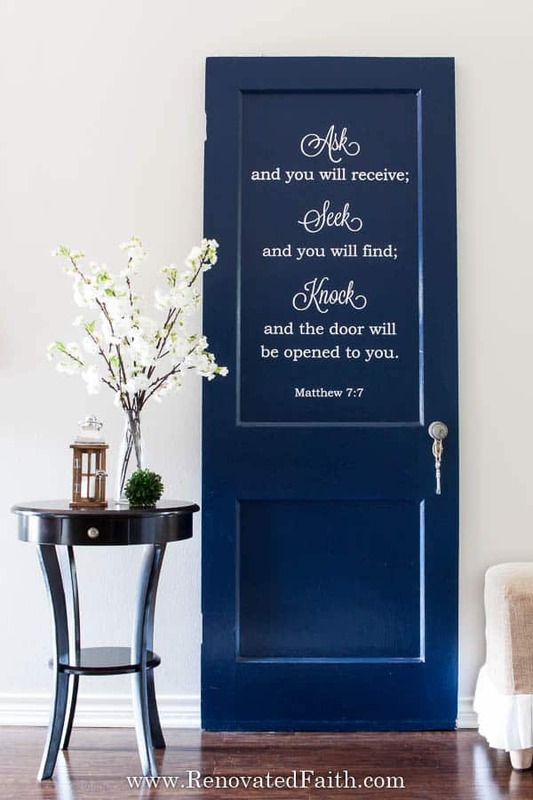 Scripture wall art is one of my favorite ways to decorate with Bible verses. I like hanging wall art in areas I frequent the most and am more apt to look. 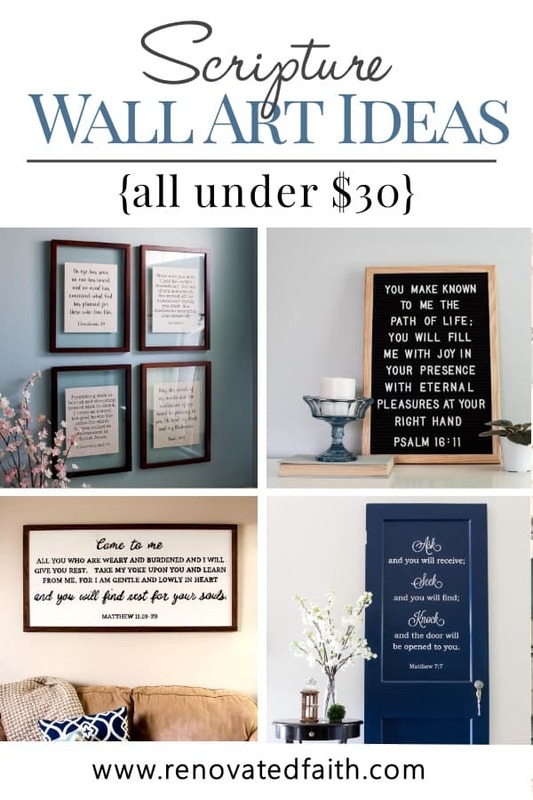 For example, I have Scripture wall art on the wall in front of my bathtub and also in the hall facing our garage entry area. Here’s a farmhouse style sign that I “painted”. Okay! I used a homemade stencil and a sharpie but it still counts. It’s significant to me because it was my grandmother’s favorite verse. Working on a cotton farm as a little girl, she know the value of a hard’s day’s work and how it also required her to rest in God. Click here to see my easy method for making an easy diy farmhouse sign like this and to read more about my grandmother. Click Here for my easy sign tutorial – no skills required! 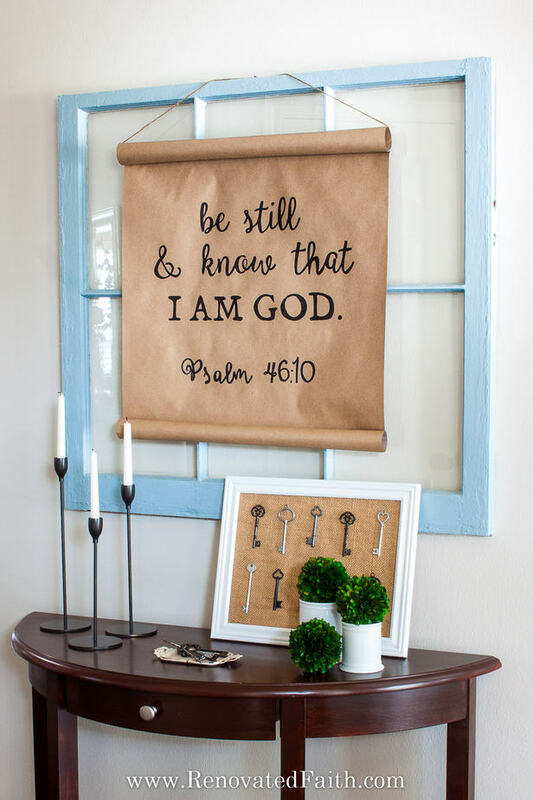 I also made this DIY scroll wall decor that has one of my favorite verses Psalm 46:10. One of the first things you are likely to see in the morning is your coffee mug so why not have Scripture there too? PRAYER IDEA FOR COFFEE MUGS : I have a friend with a cute idea to remember to pray for friends and family members. Each coffee mug in her cabinet is used to remember each of her family members and good friends. Whenever she arbitrarily pulls out a mug for her morning coffee, she prays for the person that has mentally “assigned” to that mug. It always “happens” that the person whose mug she pulls out for the day is someone that she realizes later in the day really needed her prayers! 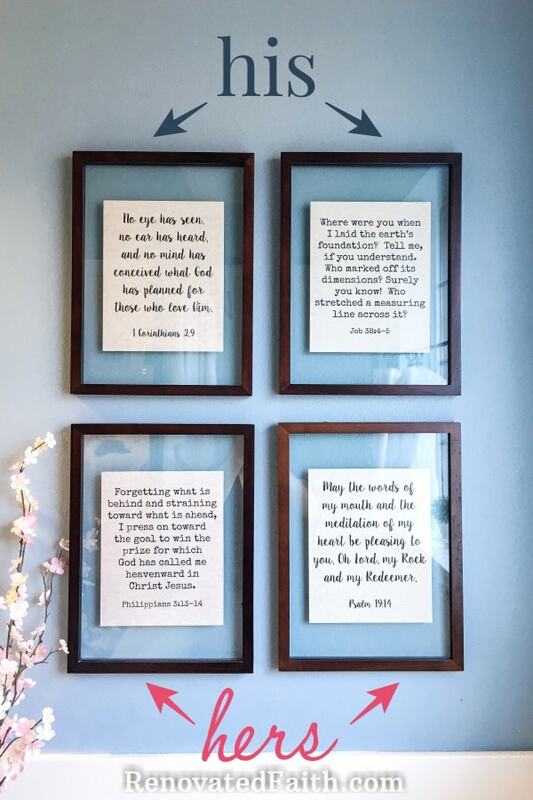 Just like my free Scripture printables above, there are several options for free printables online or you can make your own wall art collage like the one in our master bath. What’s special about this is that my husband Jeremy picked two of his favorite verses and I picked two favorite verses of my own. You can find out how I made these floating frames by clicking HERE. One verse of his is perfect for a civil engineer! A friend’s husband worked on a construction site for the renovation for a 100-year old hotel in town. My friend turned one of the old doors from the hotel into a headboard and her husband was kind enough to snag one for us as well. 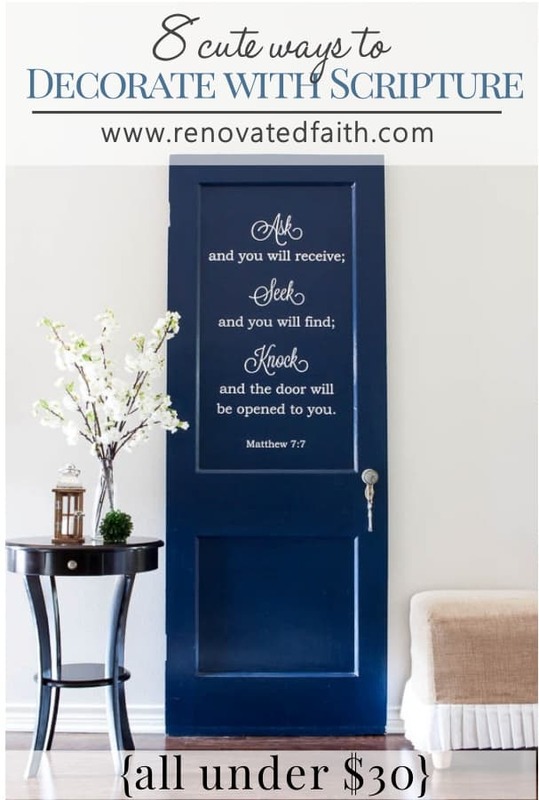 I decided to just paint it blue and added a Bible verse to it in matte vinyl from And Sew On. I love how it turned out and so many people compliment it when they come in! It’s truly a unique way to remember the power of prayer. You might be wondering what thank you notes have to do with decorating with Scripture but it’s fun to have Scripture come out of your home as well! A few years ago I read the book A Simple Act of Gratitude, where author John Kralik wrote a thank you note for every single day of the year. It is an amazing story of how the thank you notes brought him from a place of desperation to a place of gratitude and also a relationship with Christ. He was able to experience true gratitude for the first time and writes about the amazing experiences and stories that resulted from all 365 thank you notes. Because this book made such an impression on me, I try to write thank you notes to show my appreciation to others and I like to use notes that have a verse so others will recognize the true Source of my gratitude. 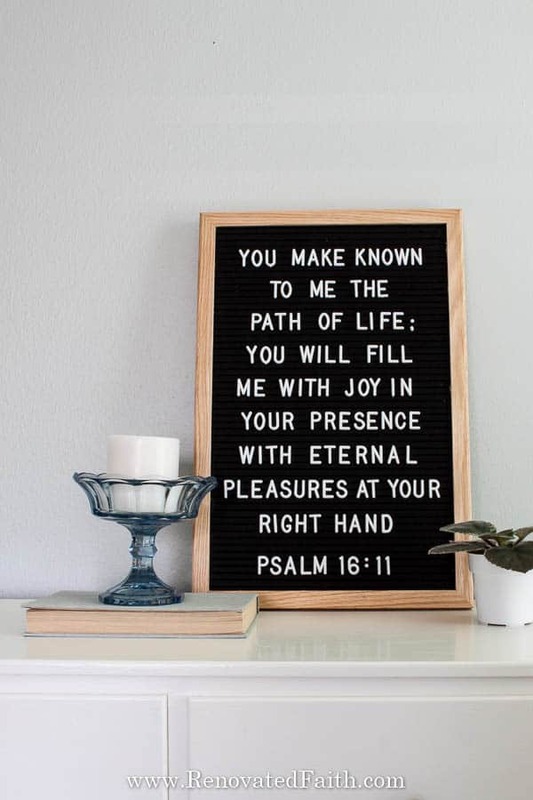 There are so many cute ways to display Bible verses on pinterest.com and one of my favorites are these fun felt boards. You have endless possibilities of what verse you’d like to display and I even get my daughter involved in changing out the letters. I found a great deal on my felt board here. 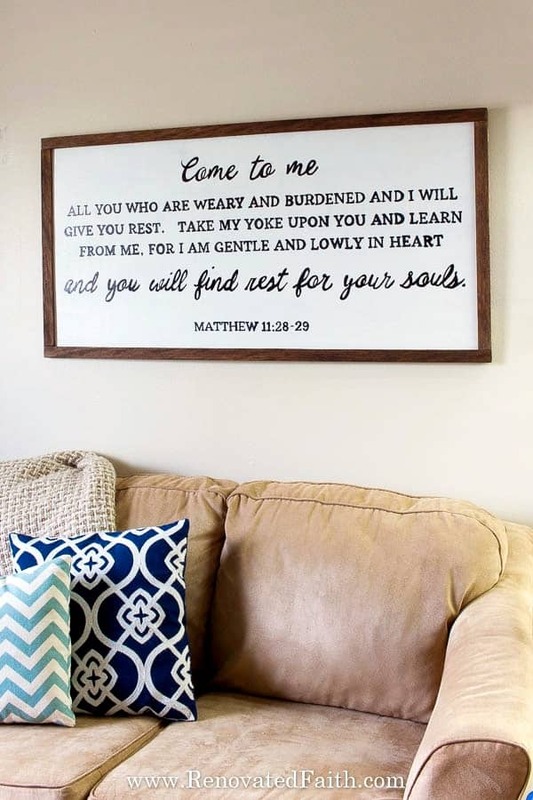 Every once in a while I’ll see pillows or throws with a Bible verse that would be a cute addition to my home decor. I don’t have one of my own yet but this pillow cover is very tempting to buy for our office loveseat and you can’t beat the price! Sometimes art work that doesn’t explicitly show a Bible verse is just as effective as one that does. When I look at this blueprint I think about how my grandparents house in New Jersey was never built. If it had been, I may have never been born. 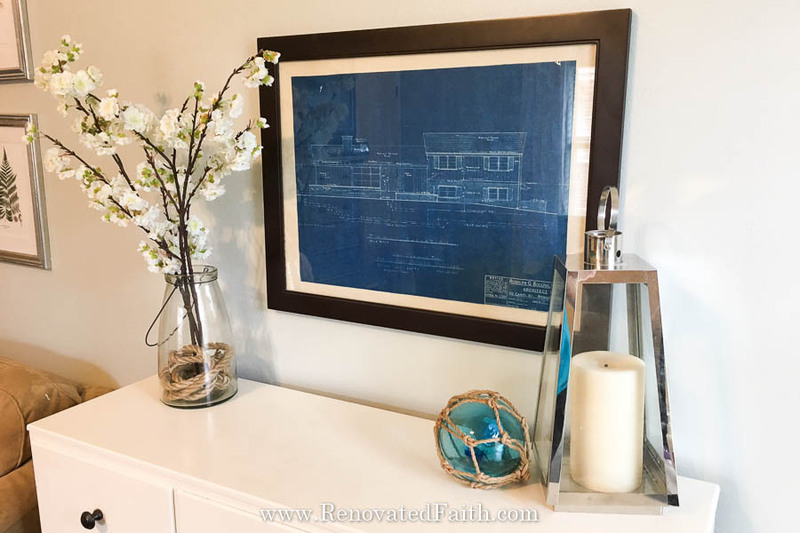 I share more about that story and how to frame blueprint wall art HERE. Last, as much as I like to decorate my home with God’s Word, I also need reminders to pray for others. My prayer board helps me to do just that! It’s a cute reminder of who I need to pray for and I easily change out the requests as they are answered. 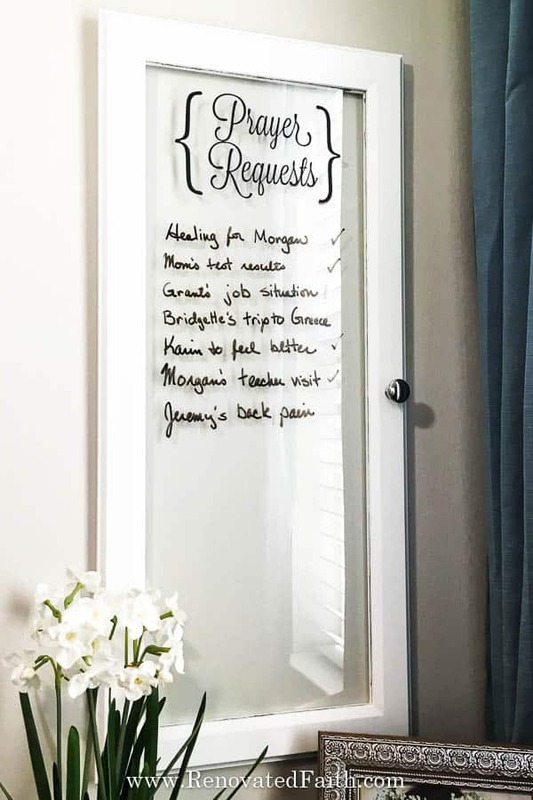 See this easy way to make your own prayer board here. BONUS IDEA: Not only do I like to fill my home with visual reminders of God’s Word, but I like to be audibly reminded of God’s truths also. In my post, The Best Podcasts for Christian Women, I share about my 12 favorite Christian podcasts that daily help me to deepen my relationship with God. Some are funny and lighthearted and others are more Bible-study based but they are a fun way to grow in your faith. What ideas do you have when it comes to bible decorations for home decor? What difference does it make in your life to be surrounded by Scripture? I’d love to hear your thoughts!